If you'd have said to me this time last year I would be talking about fitness and even gone out to buy a fitness band I would have laughed at you. I would secretly eye roll when the notifications came up on Facebook that someone had had been for a run on RunKeeper, it was just so far away from my lifestyle and what I'm used to. When I joined My Fitness Pal I entered a world that people starting talking about all of these things I'd heard about but knew nothing of such as calories, protein, saturated fats and another that kept being mentioned was Fit Bits. It was only when a client started talking about hers and raving about how good it was that it made me listen. She's not extreme athlete so she was someone I could relate to and she explained that it makes her do more which I knew was what I needed. There's all different versions of Fit Bits, depending on what you actually want from it. I chose the Flex as I wanted the sleep function but if you don't then a Zip is the next model down. It's really simple to set up and it's used in conjunction with their app on my phone so that I can view all kinds of information such as my steps, the calories I've burned, the distance ive walked and how much I've slept. 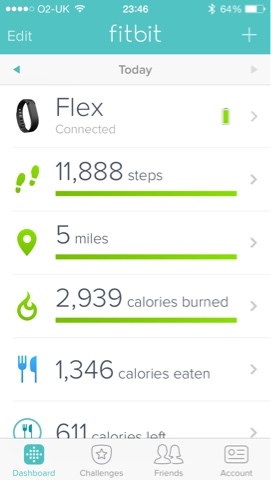 I can also do challenges with my friends to see if I can beat them with the amount of steps I've done as well.